Working on my 5th Super Scarf (for the volunteers that will help when Indianapolis hosts the Super Bowl in 2012. I swatched up several stitch patterns (mostly from the wonderful Barbara Walker Treasury series) but I just wasn't hitting on anything that met my latest design criteria - EASY, FAST, FUN. I would have liked to add Reversible to the list, but one can't have everything all the time! So I settled in on Mosaic Stitch patterns. If you aren't familiar with these, they are really nifty designs that work great in two colors. When worked in garter stitch (knit every row) you get great texture, and what looks like two-colored stranded work, without the need to work with both colors at the same time. I wanted a "football theme - what better than footballs themselves. How is this done? With slipped stitches, By slipping stitches from the previous row (knit in the alternate color) without working them with the new color, the alternate color is "pulled up" into the next row. Voila, two colors in one row without stranding. I'm using the colors established for the "super scarves" but i think these would look great in any team colors. There could be a maize and blue one in my near future. There are some restrictions that make the design process interesting and fun. And I find working these designs really fast - I get the "just one more row" syndrome whenever I work from a chart. The download for the pattern is available over in the complimentary pattern section on the right, or from the link to my ravely store at the top. I hope you give this a try- it really is nothing more than a garter stitch scarf. I also think this pattern would look very interesting if done in the round using stockinette stitch. Maybe a felted bag? This is very cool! I know of about 500 people that would want me to knit this scarf for them if they knew about it. aww - send them over here anyway and we'll teach them to knit their own scarf! thank you so much for this pattern, I have always been leary of charts but this is so pretty I am gonna give it a shot. If you have any problems with the chart - just let me know. Once you get the hang of it - these are sooooo easy. Hi Sarah. I have started this pattern and am enjoying it very much...thank you! I thought I would mention that I believe there is a small error on the chart. On the last row, the first square is white, but I'm sure that is supposed to be a "black" row. By the time you get that far in the chart, it is easy to figure it out, but I thought you may want to correct it. Hi Christina - Right you are! Thanks for letting me know - it has now been corrected and a new version uploaded. I think that as you said, my test knitters were on auto pilot by that time and just didn't notice that in the chart. But I'm happy to have a chance to correct it. I'm glad you like the design. I've been trying to work out a basketball version, but am just not having good results. Will keep trying though; these are fun to do. I just saw the post about knitting for the volunteers today on the Colts Facebook. I am sooo excited! Just to think, a scarf I make will be useful in the Super Bowl at the new Colts stadium! We live in Arkansas, but we are HUGE Colts fans, anything to help them makes my smile, thanks for your pattern, it looks fantasic! 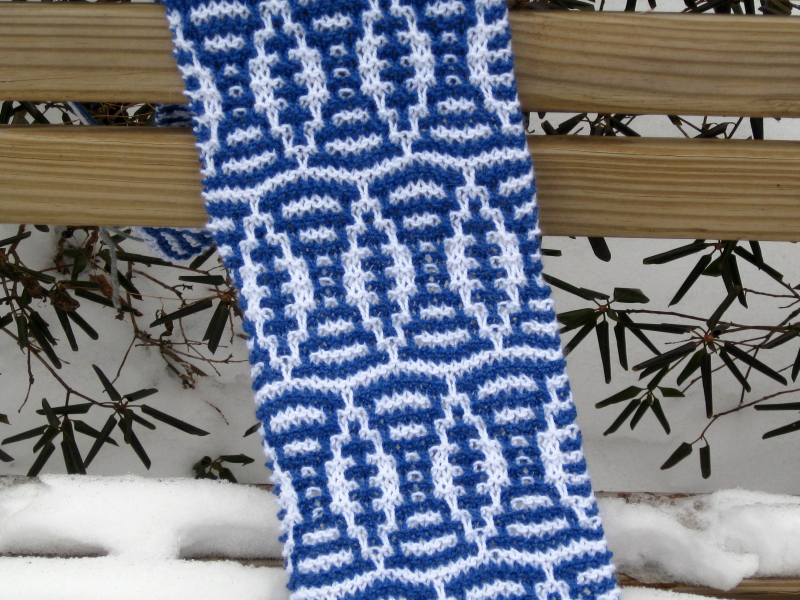 LOL searching the web for scarf pattern with football for super bowl and COLTS colors... you beat me to it!! BEAUTIFUL!!!! But going to try it anyway.. would also make AWESOME xmas gifts!!!! How about a hockey scarf? Wow! It is so cool, beautiful design. My husband, sons and grandsons will love it. thank you. Hi - I think you need to update your pdf reader. Try that. Last, just a friendly reminder - please don't request copies of patterns (even free ones) as this is a violation of the designer's copyright. I will send you a copy of the pattern directly. Hi, I would like a copy of this pattern, I have windows 8 - up to date office and adobe and this reader will not down load into windows 8 compatibility issues my email is lynnmckeon@yahoo.com Thank you! Am I missing how to get the pattern? I don't see an option. Thanks. look for the complementary patterns section on the right hand side of the blog. Then scroll down to find the link to the football mosaic scarf pattern. Sarah, I'm sure that seemed obvious but I didn't realize it was there since I used an iPad. Thanks. I see it on the computer. Prettier there too. Deb, it's no problem; I hope you enjoy the pattern. And thanks for the feedback about the different appearance on Ipad. It never occurred to me that the layout might be different. Will explore a bit on my husband's ipad to see if I can make some changes. Brave new world for me! Tammy - the complimentary patterns are all linked on the right hand side of the blog. If you are viewing on an ipad, you have to manually scroll over to see the right hand side. This is a great pattern! Thanks for sharing it! I wonder how it would work with knitting in rounds. I'm new to knitting I want to try the football pattern when I start do I attach both colors of yarn?